Talking Gourds Tour with Kate Kingston of Trinidad. Tuesday at Arroyo Telluride on October 4th at 6 p.m.
Wednesday at Cimarron Books in Ridgway on Oct. 5th at 1 p.m.
Thursday at the Lithic Bookstore & Gallery in Fruita on Oct. 6th at 7 p.m.
TELLURIDE – The Telluride Institute’s Talking Gourds Poetry Club takes a last turn for its first Tuesday series at Arroyo Telluride on October 4th at 6 p.m. with Kate Kingston of Trinidad. Arroyo Telluride will be closing down in early October, and the Kingston reading will be the last Talking Gourds performance at Mayor Sean Murphy’s wine bar and gallery. Kingston has published two books of poetry, History of Grey, a runner-up in the 2013 Main Street Rag Poetry Book Award and Shaking the Kaleidoscope, a finalist in the 2011 Idaho Prize for Poetry. Her manuscript, Motheresque, was a finalist in the 2015 May Swenson Poetry Award. She is the recipient of the W.D Snodgrass Award for Poetic Endeavor and Excellence, the Ruth Stone Prize and the Atlanta Review International Publication Prize. Her poems have placed as finalist in the Rumi Prize in Poetry, the Pablo Neruda Prize for Poetry, Blue Light Press Poetry Prize, the St. Louis Poetry Center Best Poem Contest, and the Alexander and Dora Raynes Poetry Competition. Kingston has been awarded fellowships from the Brush Creek Ranch Foundation for the Arts, The Colorado Council on the Arts, Harwood Museum, Helene Wurlitzer Foundation, Jentel, Ucross, and Fundación Valparaíso in Mojácar, Spain, among others. She received her MFA in Writing from Vermont College of Norwich University and has served as Language Department Chairperson at Utah State - South, and Professor of Spanish and Writing at Trinidad State, Colorado. 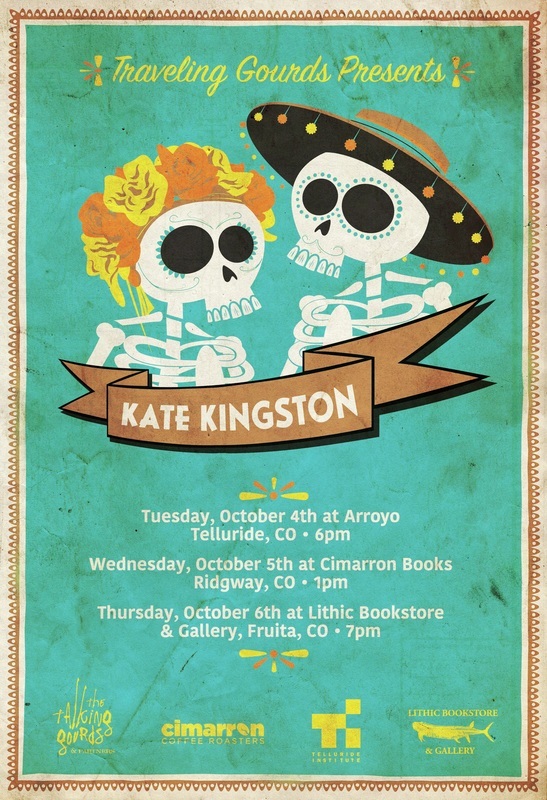 Kingston will go it alone on the Traveling Gourds tour and appear in Ridgway at Cimarron Books at 1 p.m. on Wednesday Oct. 5th. For info there, contact Sara Doehrman at saradoehrman@gmail.com or 970-708-4027. With the loss of the bond issue for the Montrose Regional Library last November, the Open Mic series in Montrose has now been cancelled. But Kingston will appear Thurs. Oct 6th at the Lithic Bookstore in Fruita at 7 p.m. Lithic Bookstore & Gallery is located at 138 South Park Square #202 in Fruita (Upstairs -- enter through lobby door on the east side of the building on Mesa Street). For more info, contact Kyle Harvey or Danny Rosen at (970) 858-3636. In Telluride, following Club announcements and the featured performances, there will be a short intermission, after which the gourd will be passed around the room to give Club members and attendees a chance to read a poem or two. The gourds circle theme for October is “Fear.” Bring your own work or that of a favored poet to share. Talking Gourds is a multi-part program of the Telluride Institute in partnership with the Wilkinson Library, Between the Covers Bookstore, Lithic Bookstore & Gallery, Cimarron Books & Coffee, Ah Haa School for the Arts, Telluride Arts, the Telluride Mushroom Festival and Arroyo Telluride. Talking Gourds is indebted to generous contributions from Audrey Marnoy, Peter Waldor, the late Elaine Fischer, Sean Murphy, Daiva Chesonis, Elissa Dickson, Art Goodtimes, Rosemerry Wahtola Trommer, Danny Rosen, Kyle Harvey, and Sara Doehrman. Call 970-729-0220 or visit the Gourds website <talkinggourds.weebly.com> for more info. and snakes sculpted in sand.